The Luton Centre for Innovation was officially opened by Lord McKenzie of Luton on Wednesday 24th September 2008. The Innovation Centre and Business Base came about as a direct response to the closure of the Vauxhall Car Plant in 2002. The Borough Council worked with various stakeholders to form the Luton Vauxhall Partnership which secured more than £18 million of funding from EEDA, the Office of the Deputy Prime Minister (ODPM) and the European Regional Development Fund. 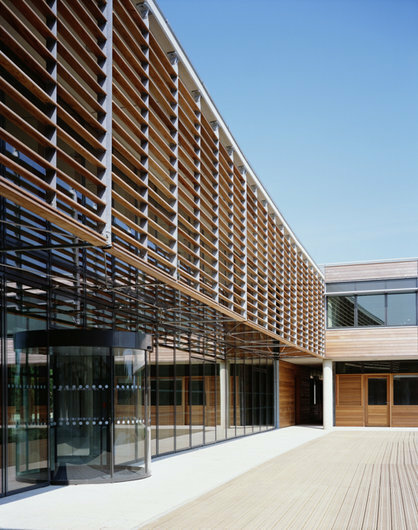 The centre was developed by Luton Borough Council and is operated by Basepoint, a specialist office management company. The Centre will provide 100 high-end office units for technology start-ups, leading the town's move towards a high-tech, knowledge-based economy. The building is naturally ventilated and contains automatic opening vents to provide night-time cooling. Exposed concrete soffits provide thermal mass to help moderate temperature fluctuations. A large lake in the centre of the development provides support for a wide range of wildlife as well as helping to deal with the rainwater run-off from the roof.